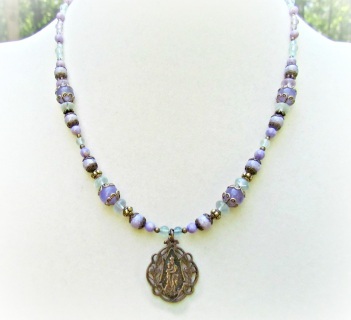 Beautiful wire wrapped and beaded gemstone necklaces with Catholic medals. Contact me for more information or to special order. Lovely Fluorite Gemstones and Lilac Riverstone bring the colors of Spring to this necklace. Carefully chosen brass components give this necklace a Victorian vintage look with timeless appeal. The medal is a solid bronze Our Lady of Victory hand cast from an antique piece. 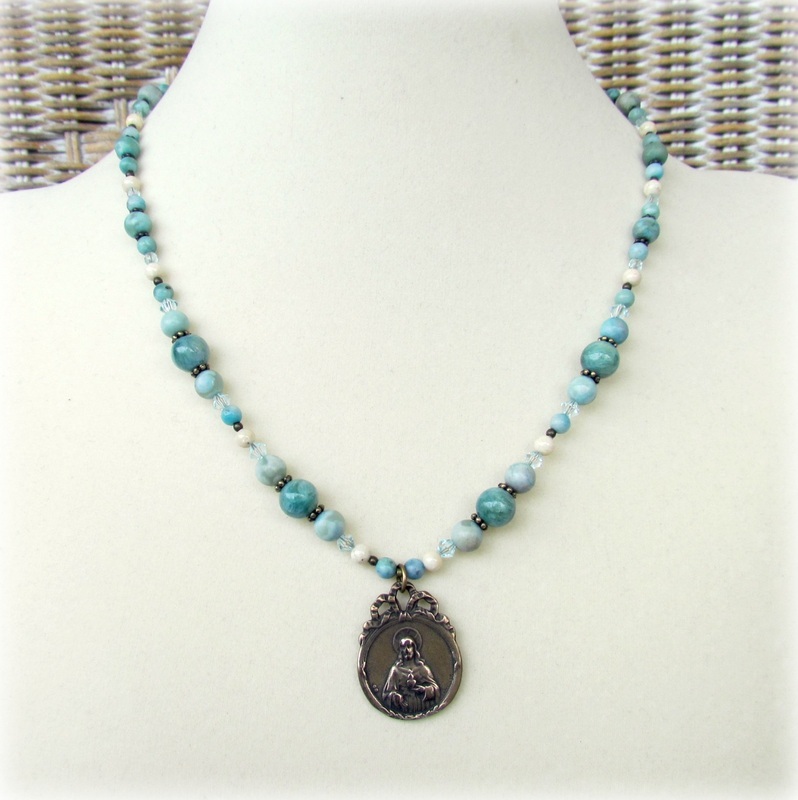 An antique reproduction Marian center is the focal point of this lovely necklace. The center was hand cast in solid sterling silver from an antique piece. 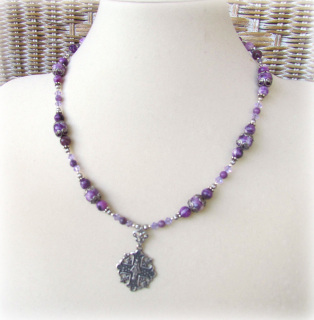 Swarovski pearls and Czech Crystals punctuate the silver chain. I have used solid stainless steel chain and wire for durability and strength. Stainless steel has an antique look, but does not tarnish or rust. The bead caps are pewter and will not lose their silver color. I have not used any plated parts. This necklace is Nickle free. It will not cause a reaction on people with Nickle allergies. This piece is durable enough for everyday, but classy enough for a special occasion. 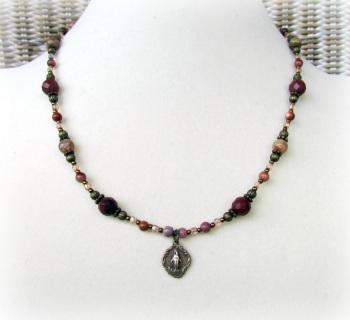 Beaded Necklace with purple Jasper gemstones. 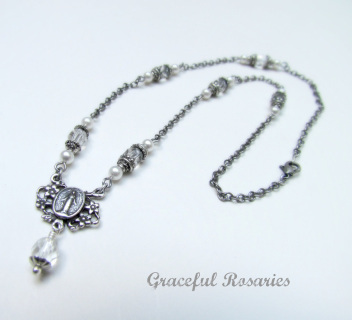 Sterling Silver Our Lady of Grace antique reproduction medal. 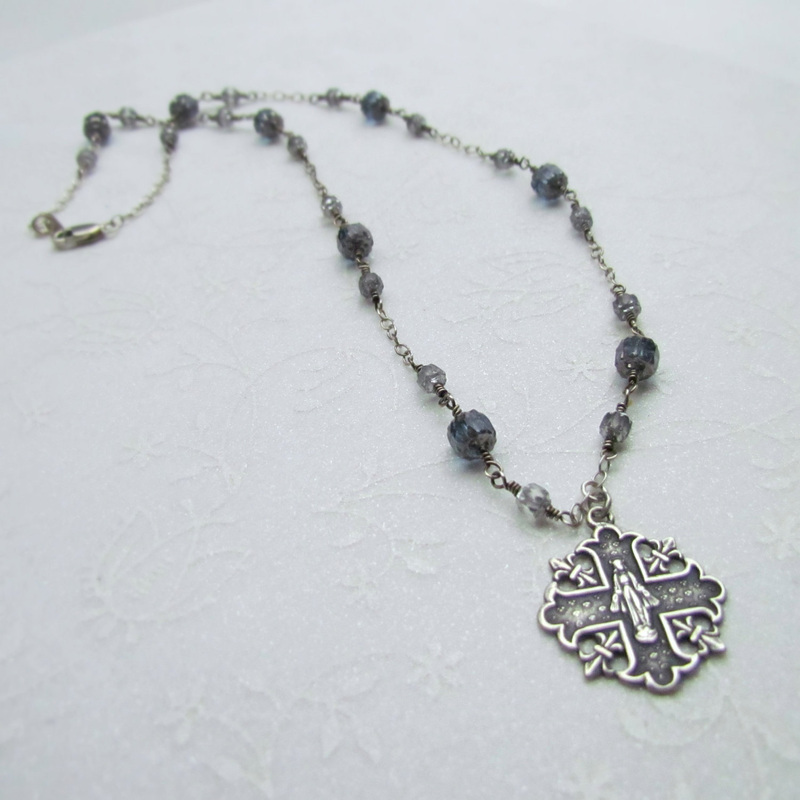 The findings of this necklace are silver plated. 18" long with a 2" stainless steel extender chain and lobster clasp. Sorry technical difficulties have resulted in a fuzzy image. Denim Lapis and Angelite Gemstone necklace with Our Lady of Grace Bronze medal. This beautiful necklace highlights a beautiful French antique reproduction medal with Our Lady of Grace. 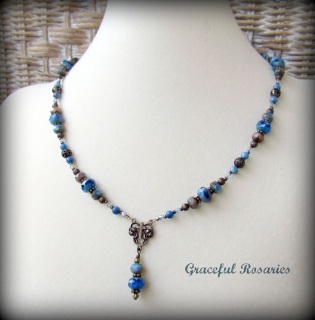 The necklace is strung with Denim Lapis Lazuli, Blue Jasper, and Angelite Gemstone beads with antiqued brass gemstones. The necklace measure 18" long with a 2" extender chain. If you would like the necklace made longer, please contact me. 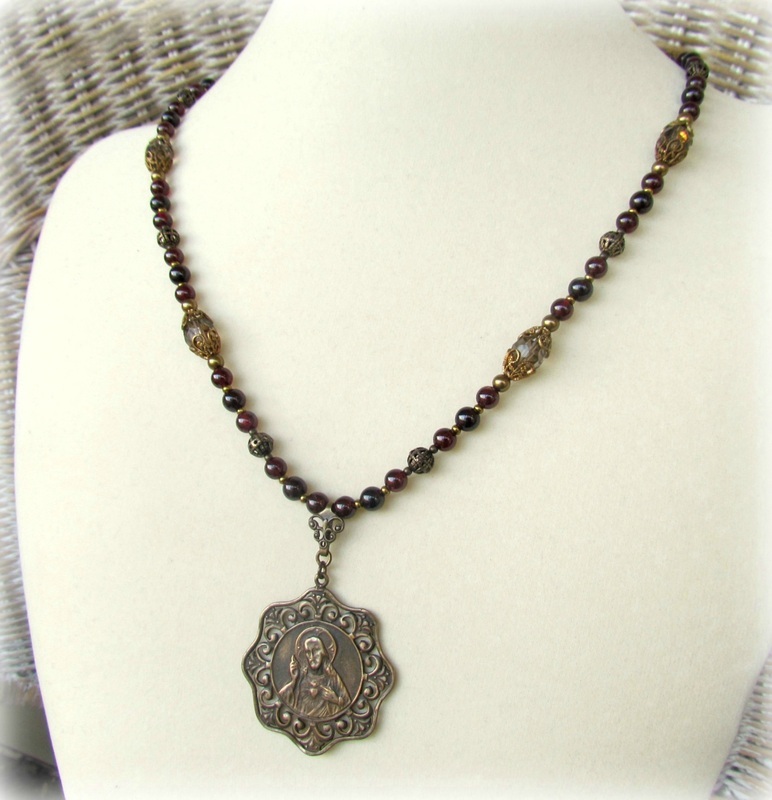 _Garnet and Swarovski Crystals Necklace highlight this gorgeous antique reproduction Catholic medal of the Sacred Heart of Jesus. A vintage look and one of a kind piece. Sacred Heart medal measures 1 1/2" in diameter. Does not include bail and loop. 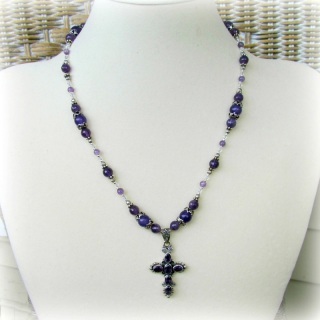 Necklace measures 20" long and extends further with a 2 inch extender chain and lobster clasp. The Sacred Heart of Jesus medal was hand cast in solid bronze from an antique piece. I have polished it leaving just enough patina to show the details and preserve the vintage quality. Then, because bronze will continue to oxidize in the natural aging process, I have rubbed it again with museum grade polish to protect it from air and moisture and slow down further oxidation. Available for custom order. Please allow 7-10 days for deliveryr. 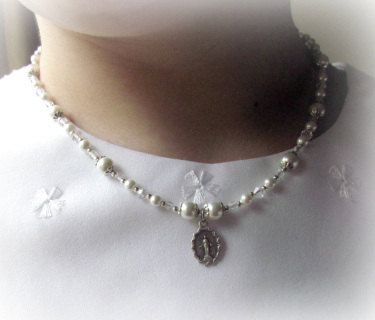 A beautiful pearl, miraculous medal necklace for First Communion or any special occasion. Antique silver plated Miraculous medal and findings. It is made with super strong Jewelers wire construction. This necklace is a small size and measures 14" and extends to 16"
A beautiful Christian Cross Necklace with Faceted Czech Glass beads and Bronze Antique Reproduction center. 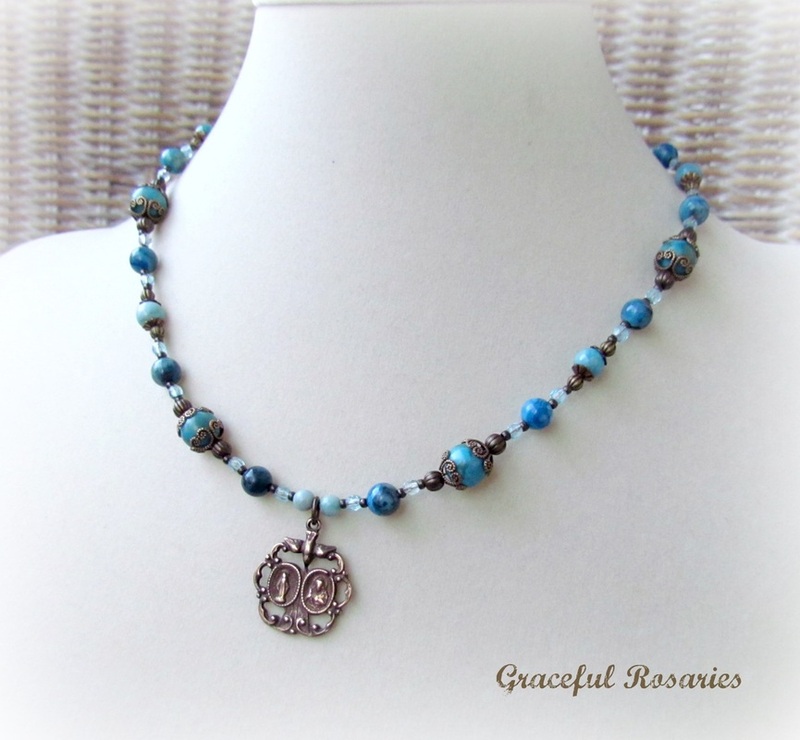 This is my own unique Graceful Rosaries Necklace design. Strung on State of the Art Jewelers Wire. This wire consists of 49 strands of Stainless steel that is bundled together and nylon coated. It is finished with a lobster clasp, with extender chain. The cross center piece is solid bronze hand cast in the USA from an antique piece. 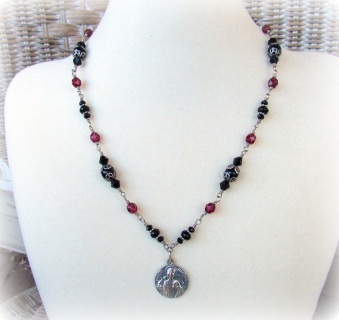 The necklace measures from18" to 20" long with a 2" extender chain.Product description. Pictures do not capture the gorgeous Amethyst beads. The faceted beads catch the light and have a lot of sparkle. The necklace measures 20 inches long and is finished with a Stainless steel lobster claw and 2 inch extender chain. 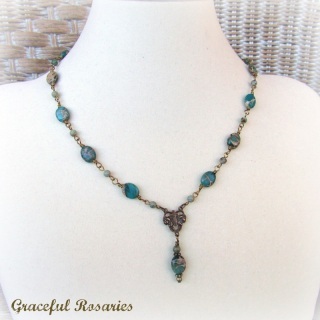 Green Jasper gemstones and riverstone beaded necklace with Scapular medal. 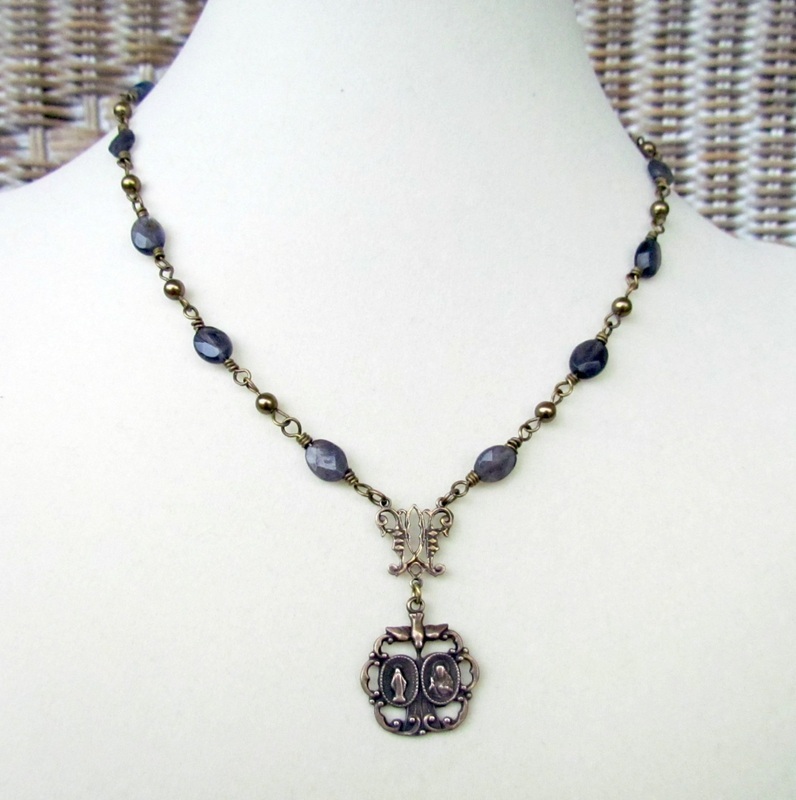 Gorgeous faceted Iolite is wire-wrapped with Bronze Swarovski pearls and solid brass wire. 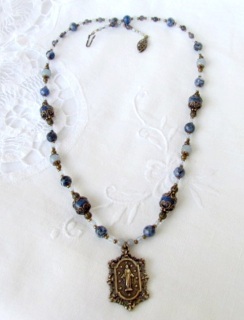 Features a beautiful antique reproduction Scapular and Miraculous medal combination medal, fully detailed on both sides. 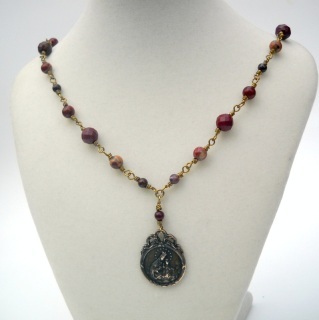 a mixture of Jasper Gemstones, Czech crystals and bronze accents, highlight this miraculous medal. Necklace measures 18" with 2" extender chain. SOLD Thank you very much. A beautiful Scapular Medal Necklace with Faceted Czech Glass beads and Bronze Antique Reproduction center. The necklace measures from16" to 18" long with a 2" extender chain. One necklace available. Matching earrings available upon request for $15. SOLD Thank you very much! This necklace has gorgeous gemstones and a lovely antique reproduction scapular medal. It is made with several sizes of Mookaite Jasper gemstones. Each individual gemstone is wire wrapped with solid bronze wire. 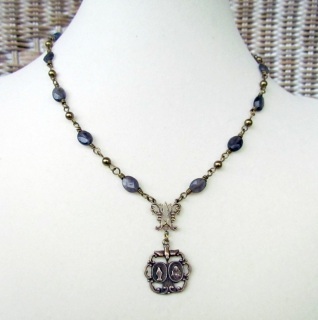 This necklace features a beautiful solid bronze medal, and clasp. Both are hand cast from antique pieces. One side of the medal features an image of the Sacred Heart, the other side features a beautiful image of Our Lady of Mt Carmel. See details of medal below the Green Jasper Necklace above. By permission of Pope Pius X, the Scapular Medal, once blessed, can be worn in place of the cloth scapular. Bronze is a very durable medal and develops a beautiful patina with time. It can be polished to increase its luster. SThis beaded necklace was made to showcase this gorgeous antique reproduction Eucharistic medal. The detail and beauty of this medal is exquisite.The medal was hand cast in solid sterling from an antique piece. 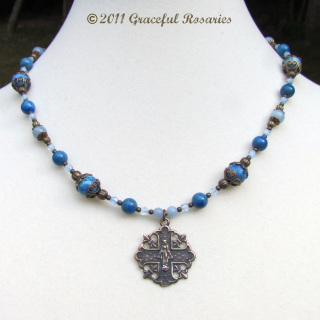 The necklace is made with almost transparent blue Czech Fire Polished crystals, accented with Angelite gemstones, Swarovski pearls, Swarovski crystal bicones, Sterling rondelles and sterling beads. The necklace is strung on Jewelers wire---49 strand of stainless steel that is nylon coated. It has a 26lb tensile strength and is very strong. The necklace is 18" long and is finished with a lobster claw and has a 1" Sterling silver extender chain. If you need an adjustment of the length, please contact me before purchase. SOLD Thank you so much! Bronze Miraculous Medal Gemstone Necklace and Earring Set. This necklace features a gorgeous antique reproduction Miraculous Medal, fully detailed with the Miraculous Medal symbols on the back. This original design features several semi-precious gemstones: Lapis Lazuli, Aragonite, Sodalite, and Iolite. The necklace measures 18 inches in length. 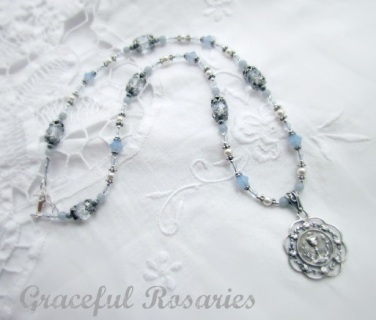 the Miraculous Medals measures 1 1/4 long.